The early childhood education program has a relaxed, comfortable atmosphere with a distinct Christian emphasis. Believing that every individual is a unique creation of God, the curriculum is designed to help each child grow spiritually, emotionally, socially, physically and academically. We offer classes for 3 and 4 year olds. Our preschool is registered as a Voluntary Pre-Kindergarten (VPK) Provider. This FREE state funded program is offered to all children who will be 4 years old on or before September 1. Our program continues to provide our Bible based curriculum and offers weekly special classes in Spanish, Music, Library, Computer, and Physical Education. The student to teacher ratios are 9:1. If you are interested or would like more information about any of these programs, please contact the Admissions Office at 941-792-5454 x150. 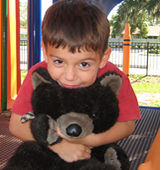 For more information regarding VPK, you may visit their website at http://www.vpkflorida.org or call toll free at 1-866-357-3239 (TTY: 711).